As we walked the cobbled streets of this ancient and mystical village, I cherished the years of history that were embedded in the walls. There was so much to see and take in, but we only had a few hours before we had to meet our tour bus at the bottom of town. I walked with my family, trying to take in every detail. It was truly a magical place and each of my kids was allowed to buy one keepsake during this memorable journey. I gave them a budget and told them to wander. Of course my daughter chose a beautiful piece of jewelry; I expected nothing less. My youngest was happy with a little trinket toy, which probably broke before we boarded the plane. But my middle son, 9 years old at the time, was looking for just the right thing. In fact, he knew exactly what he wanted; he was just searching for the perfect one. We came upon an old shopkeeper who had a small assortment of instruments. My son’s eyes lit up as he searched through the pile to find the right one. Now, this was no ordinary instrument. It was magical and mystical and spiritual in every imaginable way, and this is exactly what he wanted. I didn’t know how to play this instrument, and neither did by husband. But that was no deterrent for my son. He was confidant that he would learn to play it. The shopkeeper was delighted that such a young boy had a desire to entrench himself in tradition and history. He ensured my son that although it would be difficult to perfect the sound, all he needed was practice and that he too would be able to call upon the angels with this magical instrument. My husband and I were delighted as we walked back to our tour bus. Each of our children had made a purchase that was meaningful to them. They were leaving this town with something that would forever remind them of our journey and our personal history. As we prepared to board the bus, a member of our tour asked me why I had allowed my son to buy this instrument. At first, I did not understand the question. But she went on to say that he was too young and there was no way he would be able to play it. In fact, she said his lungs were not even developed enough to have the strength needed to play it. I thanked her for her advice and took my seat on the bus. It never occurred to me to tell my child that HE CAN’T, that he is NOT ABLE to. Sure, I have a lot of “you may not” and “you do not have permission to,” but there is rarely a situation that calls for a “YOU CAN’T.” How am I to know if my child can or cannot? Who am I to say whether he is capable or not? Doesn’t he have to try it first to know? Maybe my openness to trying new things stems from the type of home I grew up in. Don’t get me wrong; there were plenty of rules in my parents’ home. In fact, there were probably more things we did not have permission to do, than things we were allowed to do. But none of those had to do with what we were able to do. From a young age, we were encouraged to do things: we learned to ski when we were 5, we dove into the deep end as soon as we could swim, we learned to do back flips, roller blade down steep hills, climb to the top of trees and surf. We never heard the words you can’t because you are a girl, because you are too small, or because you are not capable enough. And we were never pitied when we scraped our knees, took a tumble off the balance beam, or wiped out on a wave. And as such, we just got up and did it again, because that’s just what you do. As I was busy daydreaming about the unnecessary limitations we place on our children, my son was sitting with our tour guide getting his first lesson on how to play his instrument. 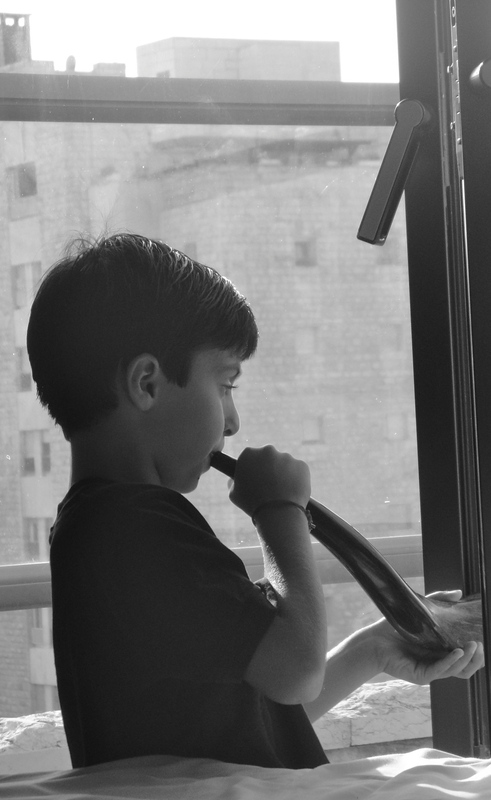 By the time we got to our hotel room, he was ready to begin practicing the different sounds he had learned. Now don’t get me wrong—it was painful listening to him perfect this instrument. In fact, we often begged him to practice in the back yard. But in no time at all, not only did he learn to play this instrument well, he mastered it enough to play for crowds of 100’s of people. As he closes his eyes and calls upon the magic of this ancient and far away land, I get tears in my eyes as I think about how I almost let someone tell my son HE CAN’T. I assume you’re talking about the shofar?? If so, all three of my kids bought different ones in Israel. They all “play” it and look forward to using it during the high holidays. Beautiful piece…. Thank you for sharing. Such an important lesson and reminder for all parents out there. Setting limitations and restrictions unknowingly hinders our children from reaching their true potential. I’ll buy myself a pair of earplugs and remember that when they have piano practice. Such a wonderful article. Thanks for sharing. Great piece, agree totally. As long as you tell him “can’t” when he’s sitting behind me and starts to play on the plane ride home. Erin, you are too funny. At that point, I would probably talk about “you shouldn’t” and have the conversation of “how would you feel if…” Thanks for reading! Loved it. Thank you for sharing. This reminded me of my son when he was growing up. He had tons of imagination and ideas, and we could never say NO YOU CAN’T to any of them; and that’s why his creativity never STOPS!!! Love this article. So true.